Najib: You can deliver, We will Deliver! July 30 – Datuk Seri Najib Razak pledged to do all he can to bring the Indian community back into the “mainstream of development” but asked that MIC redouble efforts to secure the community’s vote. The prime minister said there must be “quid pro quo” between Barisan Nasional (BN) component party MIC and the ruling coalition if both wished to benefit from their relationship as “loyal friends”. “There must be an understanding. Can you all deliver for Barisan Nasional? You can deliver and we will deliver,” Najib told delegates at the 65th MIC general assembly here today. The 2010 census showed there are 1.9 million Indians or 7.3 per cent of the 28 million population, far less than the 2.3 million foreigners in the country. Indians are one of the main ethnic groups in Malaysia who has contributed significantly to the early developments of the country since pre-Independence times. They are hardworking and have been somewhat sidelined by the BN Government since the first General Elections. However, many Indians have progressed by themselves with little or no government help to become excellent professionals. There are a pronounced number of good doctors and lawyers who are of the Indian ethnic group. The MIC was one of the parties who worked on the Independence of Malaya with Tunku Abdul Rahman alongside Umno and MCA. And after 54 years of independence, our Malaysian PM is still bargaining with MIC on community development of the Indians. How sad has things become in this country? Isn’t the development of every community the entrusted responsibility of the government of the day? Regardless of how they may have voted, still a sizeable number voted the BN. So if after 54 years of pathetic Indian community development, Najib claims that this can all change for the better with a “quid pro quo” with MIC bringing back the Indian votes to BN? Anyone who believes this can be done when after 54 years of BN rule couldn’t will believe in santa claus bringing gifts down the chimney (even when don’t have chimnies in Malaysia). This is all fine political rhetoric to garner support for votes with little thought into how to execute the promise of development. If the BN Government has seen the importance of non-partisan development, the Indian community would not have walked the streets in 2007 with the rise of Hindraf demanding for better treatment to their plight. B. that Najib will only try all he can and that gives no guarantee even after the votes come in to the BN. Essentially, the offer really means MIC do your part and we’ll see if I, Najib, can do anything in return. Najib is the PM. He is the very man in power. Of course he can do anything for the Indian community if he so wanted. But making statements like “I will do all I can” implies there are others who can block his efforts. Then he is really not the PM, is he? Instead, Najib should have said “I will give development to the Indian community” without a shadow of hesitance or doubt, but alas, he said weak words that can otherwise mislead. Why must everything done by the PM be a political play? Najib has not stopped playing politics since he became PM. The sense of insecurity must be there because he inherited the office from Badawi. Why can’t things be done genuinely for the betterment of the country, for all Malaysians? Najib keeps playing each community and blatantly allows people like Ibrahim Ali and Utusan Malaysia to stir racial strife without repercussion. Why can Najib be the PM of all Malaysians? After all, he said to have come up with the 1Malaysia slogan. But his deputy keeps contradicting him declaring he is first Malay then Malaysian. Why must development come with a “vote for me” condition? When Najib develops the country for all Malaysians, they will vote for him, but not the other way round. Malaysians will support any government who focuses on the good of all communities. Najib must do what he says and say what he must do for all Malaysians! The biometric system that the Election Commission proposes to use in the next general election is foolproof, said the National Registration Department. The department, the custodian of the data of about 27 million people, including 12million registered voters, also said it had other details of every Malaysian, including their family trees and thumbprints, in its database. “This cannot be altered,” department director-general Datin Jariah Mohd Said told the New Straits Times last week. She refuted allegations that the department would be used to tamper with the data of Malaysians to give the ruling party an edge during the polls. The department stores and updates the profiles of citizens from the time of their birth, that is, when birth certificates are issued. It updates the data when citizens apply for identity cards at the age of 12. These forensic evidence, documents and history could not be forged, she said. It does sound quite convincing that biometric verification can be used in the next election. But the truth is at best partial. The EC voter verification system is NOT foolproof unless it is properly planned, designed and audited to have the response time and security required. Here are some serious flaws in using biometric technology for elections in Malaysia. It is as accurate as the audit done on the entire capture to archive process. Is there both an internal and external audit done? We may never know. We just have to assume that it is done right and publicly declared by recognised auditors. The NRD system was designed solely for NRD internal use. The network, security and database will not be able to cope with the load to verify electoral voters. If you had recently gone to get a new IC, you will instantly be able to tell that the internal use is already giving slow response times. What more when the queries come from all over the country at the same time every second continuously. There are 12 million voters in 2008 with an expected increase for the next GE. Traffic is dependent on voter turnout and all expectations will see a high percentage, if not higher than GE12 in 2008. We only look at major cities like Kuala Lumpur whenever we think of Malaysia. But there are many locations where voting centers are found have poor mobile network coverage especially GPRS/EDGE which such biometric verification requires. Any infrastructure which is on a best effort basis cannot be relied to give voter confidence. What happens when the network is down? What happens when there is power failure and device can’t be charged? What happens when the chip reader is faulty and doesn’t work? What happens when the buttons don’t work? What happens if … there are many instances when high tech devices won’t work as they are not properly taken care of. There will be a need for a large order for hand held scanners. In the 2008 General Election, there were a total of 7,950 voting centers with 21,822 voting stations nationwide. There is a need for EC/NRD (needs to be sorted out for security reasons) to custom order at least 21,822 units for primary use and 16,000 units for emergency use. Who will audit these units that it works properly and not programmed for additional vote rigging purpose? This is one major area of fraud exposure. It is not in the NRD audit control. Who then shall provide a reasonable level of trust for these devices? An example is that if details on a MyKad is different from the NRD database, the device can still return an appearance of a match. Another challenge is a malfunction of the device. A manual backup system is needed and clear policies as which system will be the authoritative one. The EC must think and work this out very soon and not just make rhetorics about biometric systems. We have yet to see a Government system working properly, fast and reliable for usage that is unplanned and not designed for. Even in standard use they are not designed for heavy loads. What more with so little time to plan and test for such an important event that needs infrastructure and security fully tested and audited? IT projects of such importance must be procured and implemented with proper design and planning. Not a rush job. For now, there will be a general lack of confidence all round on EC’s proposed use of biometric verification. Not until biometric technology has affected many more areas of Malaysian life to be well tested and trusted. That’s why Bersih’s demand for use of indellible ink is more practical and failsafe. No worries for technology failure. Najib Plays a Strawman Again! The government will engage with Christians groups here that love peace and respect the country’s Islamic leadership, the prime minister said today. Datuk Seri Najib Razak said the Barisan Nasional (BN) government would work with Christians who wished to uphold world peace and harmony as it was committed to the “global movement of moderates”. “We wish to tell our friends, the Malaysian Christians . . . if they respect us, we will also respect them,” he told some 200 BN supporters at Kompleks Bunga Raya here. After Najib’s visit to the Vatican to meet the Pope and establishing the beginnings of a possible diplomatic ties, he comes back to warn Malaysian Christians accusing them of not respecting the BN leadership or more specifically, the Umno leadership who are Muslims. He desperately tries to link Umno with Islam to imply not respecting Umno is disrespectful to Islam. He creates yet another strawman to shake down when he can’t point to specific instances of his so-called disrespect of Islam by Christians. Oh, that’s it. It is NOT about Christians being disrespectful of Islam as they never do that to other religions. They are people who love peace and are very tolerant to others including leaders who don’t respect them. The issue Najib is shaking down here if we read closely has to do with respect for Umno and more specifically respect to Najib and Administration who had in recent days been taking a hard stand on the Malay bibles and the usage of some number of words including “Allah” by Christians in Malaysia. The recent Sarawak state election exposed the weaknesses of the BN government in handling issues regarding the Christian community. Malaysians must realise by now that there are NO problems at all with Christians living with Muslims here in Malaysia. The Christian community has been subjected to various governmental actions including classifying the Malay Bible “Perjanjian Baru” under the ISA. The problem is with the government. The problem is not with Islam or Muslims. Never has! Malaysians live in harmony regardless of race and religion. We are one without government rhetorics. This time with Najib accusing the Christians of not respecting BN leaders may have basis which only he himself knows. It was the Christian community through the Inter-Faith organization that has wanted to engage in productive dialogs with the government but claims like this by Najib seems to politicize the situation to put the Christians off. One can’t imagine Najib’s intention but clearly it is a strawman argument stirring a storm out of his tea cup. If there is a single basis, then let the focus be on that issue to resolve and not make sweeping statements. Meanwhile, the Christian community lives harmoniously with the Muslims and those of other faiths and await the government patiently to be sincere to dialog. Such rhetorics only spell disaster to Najib and Umno and nobody knows why it keeps happening shooting themselves in the foot everytime. Meeting the Pope with the highlight on giving him the book entitled “Najib” does not make any Malaysians proud at all. A royal commission has ruled that Teoh Beng Hock committed suicide as a result of pressure from aggressive and continuous questioning by Malaysian Anti-Corruption Commission (MACC) officers (read here). Without having read the entire report, this press brief by Nazri and James Foong is set to stir the hearts of Malaysians yet again like another wave after Bersih 2.0. It may appear that the RCI report had vindicated MACC and will give Nazri some brownie points of “I told you so”. But will the report truly answer the questions in the minds of TBH’s family and Malaysians around the country? 1. Was the so-called suicide genuinely one? The news report said that TBH appears to become psychologically unstable to want to commit suicide after he was subjected to continuous aggressive questioning methods by 3 MACC officers. A psychiatric forensic expert appears to lend credence to this conclusion. It appears that there is no hard conclusive evidence pointing to a suicide but rather flimsy circumstantial evidence to lead to such a conclusion. If TBH was driven to such a stage in a matter of hours, someone must have helped him to “commit suicide”. Either forcing him to stand on the ledge or even pushing him off. These are also circumstantial speculation. By saying TBH’s death is purely suicide is letting the MACC off the hook too easily. 2. If the so-called suicide was not a willing self infliction, how can it be called a suicide? All suicide cases happen when the deceased has gone through a prolonged psychological stress where they can’t seem to find a way out any longer despite trying their hardest and rationalizing their actions. Then they make that fatal step to end their lives. This is not the case of TBH. A few hours of torturous questioning cannot overcome his life long anticipation of getting married the next day or awaiting the birth of his new born baby. He does not appear to be at the end of his wits. Especially he has matintained his innocence. More so that it seems to circumstantially point to highly questionable techniques by the 3 MACC officers to push him to “want” to turn state witness against his boss. Perhaps one of such technique is to make him choose his life over his boss’ life by putting him dangling out the window. Perhaps an accident happened all of a sudden that he got out of the grip of whoever held on to him and TBH fell to his death. Without firm evidence and declaring TBH had committed suicide is irresponsible indeed. The evidence is inconclusive for a suicide but actually favors a homicide. As Kit Siang had said, isn’t assisted suicide a homicide? 3. Shouldn’t those who psychologically manipulated TBH be culpable for murder? Indeed, forcing a person to commit suicide is a homicide. If TBH was truly psychologically bashed up, it still doesn’t mean that he willingly ended his own life. All circumstantial evidences point to this being highly unlikely and if he so did it he must have been “helped”. This is the most likely speculation. Is this how MACC questions non-suspects? And that includes Ahmad Sarbaini too since he also died under strange ciscumstances at another MACC office. Shouldn’t questioning be done in a recorded setting? Or will such recordings be tampered with like the MACC CCTV recordings when it mattered? In developed countries, the chief of MACC would have resigned because such happening will permenantly taint an institution which relies on absolute credibility to perform its duties. All we can say is that MACC will find it very difficult to get out of an inward spiral of internal destruction in the eyes of the public. Why would anybody trust the MACC when people continuously hold it up with utter disdain now? It will take more than a miracle to vindicate the MACC and the people’s patience is wearing thin. Prime Minister Najib Tun Razak said street demonstrations are not the answer to grouses against the government as they may well spiral out of control, possibly causing casualties and damage to property. First, Bersih 2.0 had already agreed to heed the King’s advice to take the rally to the stadium. Najib reneged on the offer relegating the rejection of use to the Police and his Cabinet. Bersih wanted to use Stadium Merdeka. Najib and the Police kept playing tag to deter the rally completely. Regardless that Stadium Merdeka was not given for Bersih’s use, they kept to their word not to hold a street rally and planned to just gather at the carpark if the Stadium was still not available at 2pm. By sheer insane action determined to inconvenience everybody and deter the crowd from joining the 9 July rally, the Police locked down the entire city near to the Stadium. By freezing bus permits to enter KL and hoping to “cut off” the leaders from attending through a court order, the 1500 police and FRU personnel were briefed to arrest anyone as they saw fit. How did Najib thought that people were going to the Stadium if not by foot? With baricades at the roads leading to the Stadium and road blocks all around the city, Malaysians took to the streets just to walk to the Stadium. There was just no other way. And Najib blames Bersih for a street demonstration? This entire episode is caused by Najib himself by continually fueling anger and hatred of Malaysians against him, the Police and the Government. Immediately after the Saturday 9 July Walk for Democracy, Najib made a war cry declaring that he too can bring a million Umno members to the street if he wanted. He also said that he sent Umno Youth to protest on the same day and was so proud of it. That tantamount to admission that illegal rallies are OK with the Patriot also declared illegal by Hishammuddin too. So is the PM speaking from both sides of his mouth? That street demos done by Umno is Ok but those by others are not! Umno has been doing street demos for the longest time. Demo at the US embassy, demo at Komtar, demo at Jalan Bukit Bintang. Seems that it is Umno’s right to demo but nobody else. Malaysians at the Bersih 9 July Walk for Democracy want to speak up and speak out to the government to reform the elections to make it clean and fair. Bersih 2.0 show truly mature Malaysians who are not into the so-called Arab Spring Uprising but to declare 8 points for electoral reform. Malaysians want to use the election to vote their hearts but they can only truly do so if election is clean and fair which today is not. The Government and the Election Commission say that it is and the 8 points cannot be implemented. In fact, they can be reformed but the Government will not as it is the recipe to stay in power. It will take a miracle for the Government to lose power with the current electoral setup. Malaysians do not believe for a moment that the Election Commission will ever entertain the Bersih 8 points. Malaysians do not believe Najib will ever come to terms to ever listen to the people as he will not want to concede political loss by making a level playing field. As Malaysians have seen of our dear PM, he has only been good in his talk. His “you help me, I help you” and all the public promotions about his GTP and back stepping his offers only make people hate him more. Transformation success is only spoken by him. Economic growth is mere talk. Inflation is what Malaysians know. All others are Najib propaganda about low inflation and that life is good in Malaysia. Life is very tough now in Malaysia contrary to Najib’s rhetorics. Malaysians of all walks of life know this for real. The people who came to walk on 9 July knows how good our Government treats them. Those who read about their experiences and watched the horror of Police oppression feel for them. Malaysians support Bersih not for political reasons but for a clean and fair election that will make their votes count. That is all but the insane actions have brought much anguish to the hearts of all Malaysians. And they can vote. If Najib does not make it right soon, GE13 will be a nightmare of an election for Umno and BN. In the run up to 9 July, the Najib Administration took the position to kill off Bersih 2.0 Walk for Democracy at all cost. He has used the Home Minister and the IGP to execute some bizarre pre-rally actions by declaring Bersih as illegal, arresting people for wearing yellow and the insane charge of reviving communism in Malaysia under the Emergency Ordinance. Malaysians cannot understand why this was happening and the oppressive preemptive strike by Najib (through Hishammuddin) to kill any intent to stop the masses from showing up only brought more anger to want to do it. Najib inevitably encouraged the people to be ever more determined to go regardless of such insane actions. As if the bizarre oppressive actions were not enough, the Police started to lock down KL city from the Wednesday making it worse for everybody until Saturday. By everybody, this affected the people going to work, the businesses and all commuters into KL. The Government froze all permits for buses across Malaysia going in to KL. This action showed that Najib was trying to create the impression that there would be a threat to take over KL by some powers to be. 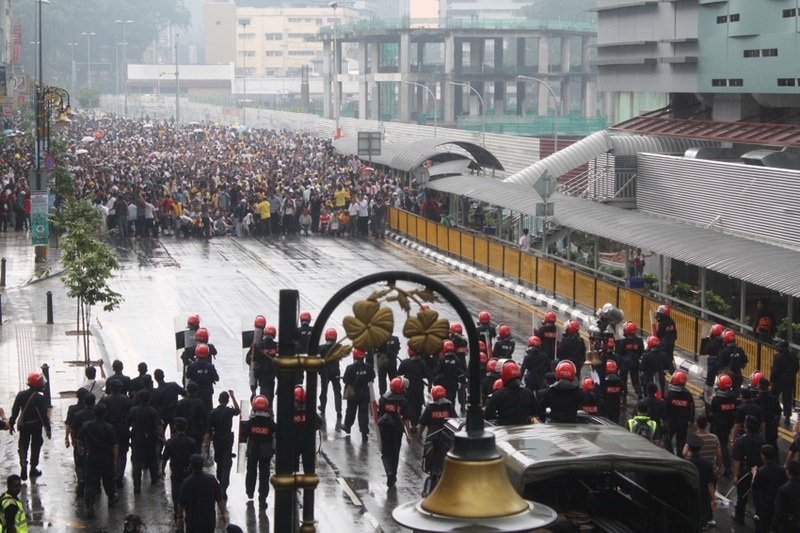 The Government brought out 1500 police and FRU personnel to keep KL in a siege condition. They even used barbed wire to block all roads to the Stadium Merdeka. 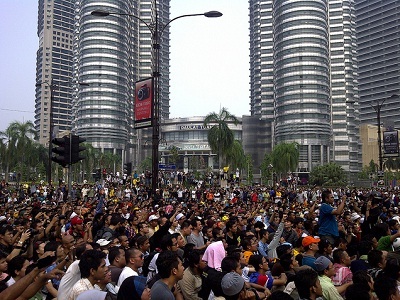 They appeared to believe that Bersih is not what it appeared to be but a Malaysian version of the Arab Spring Uprising. Even after many declarations that Bersih was a peaceful rally for electoral reforms and after having met the King on the same. All these insane sledgehammer actions and Najib’s reneging on allowing Bersih the use of Merdeka Stadium by upholding the illegality of Bersih and also instructing the stadium management not to allow Bersih to use it both fired up all Malaysians to be very incensed with the Government. And as if this was not enough, the Police indiscriminately harassed, arrested, beat up and fired tear gas and chemical laced water at the people really pushed them over. The people had first hand experience of Police brutality using their tax dollars that paid for the Police salary, the tear gas as well as the water canons. There was really no need to kick and beat those whom the police arrested. There was no need to shoot tear gas directly at the people nor do it at both ends of the group. Most of the police appeared to indiscriminately arrest and tie up the people who numbered over 1500 and many police still kicked and beat them. Regardless of how the Government wants to deny and downplay the brutality, the people is now forever convinced that the government not only oppress them but blatantly lies to the people as if only their version is truth and all other versions, no matter if personally experienced or captured with photos videos evidence by those who were there including foreign media, are rubbish. And not only Najib did not manage to achieve his objective to stop the people even after using the King to advice Bersih to take thie rally into a stadium, Najib managed to successfully do just the opposite to affirm the hatred and anger of the people towards him and Umno. Najib and friends lied about the police brutality, denied the large numbers of dissent especially when KL was already locked down, denied shooting tear gas and water into Tung Shin Hospital, denied the rights of Malaysians. At a post-Bersih gathering, Najib retorted in a war-like defense that he too can bring 1,000,000 members to the streets, a very unbecoming statement from a PM. Nobody believed him especially if these people are to be treated to the same police welcome given to the Bersih folks. Will Umno members attend if there was no food and no money? If Umno was declared illegal and the police arrested them for wearing the Umno t-shirts? If the vicinity around their meeting place was blockaded with barbed wire? If the entire KL was locked down and no bus services operated into KL? If the Umno members were indiscriminately arrested, kicked and oppressed? If they were to be shot will loads of chemical laced water? If tear gas was shot directly at them? If the Umno leaders are banned with a court order from going into KL and blocked from going to the meeting? Alas, most people will snigger a laugh if Umno members would even dared come out and most of them will follow after the footsteps of Perkasa leader Ibrahim Ali, to stay home. The goodness that came out of Bersih was the eye-opener that Malaysians are truly united regardless of race and religion. They stood together and suffered police oppression together. They came out in big numbers even under siege. This is the true Malaysian spirit. Discontentment against the Government over electoral reforms to make it clean and fair. Najib shouted they are not afraid but nothing has been done to address Bersih’s demands because all observers believe that BN cannot win in a clean and fair election. Another empty rhetoric from the PM. The argument that the opposition won 5 states showed that election is clean and fair holds no truth. Analysts believed that if election is truly clean and fair, Najib would not be the PM anymore. It is highly unlikely that there will be any electoral reforms at all because the government does not want to do it. Why change something that has helped keep BN in power all this while? If the oppression of the people and lies continue by Najib and BN leaders, we can be certain that GE13 will be the hardest election that Umno and BN will ever face. And this hatred of oppressive and corrupt government will continue to grow and grow. Malaysians will show that at the ballot box for sure! The UN and US as well as foreign media are not blind to what happened on 9 July. The world is watching us. The mature Malaysians who are peaceful people showed that they only wanted to peacefully make a statement to have electoral reforms. Only the people honored their words. Not the Government. Najib, beware of the inevitable end unless you make things right in the immediate future! Clean things up and make things right! Now that the dust is settling, it is evident that there are many significant lessons and outcomes from the brave Malaysians standing up for a justice against oppression by their own Government and Police. 1. Malaysians have shown that they are mature and will stand up for justice. This is true people power yet Malaysians are peaceful people. Regardless how the Police tried to lock down the city and barricade Merdeka Stadium, there were over 100,000 assembling all over the vicinity of Merdeka Stadium to get pass the Police and all their tear gas and water canons. And peacefully too. Noticeable amidst them was 76 year old national laureate A Samad Said. 2. Najib who last minute decided not to leave town after being severely criticized for wanting to abandon the country at such an hour. Najib who reneged on his stadium offer. Najib who ignored the King to discuss with Bersih. Najib who totally played deaf and dumb to the 100,000 crowd in KL and pretending they were a small group of dissent. Najib who has lost all credibility as a statesman of Malaysia allowing the Home Ministry to severely oppress the people. Najib who remote controlled the Police. Najib who may be having his last term as PM after today. 3. Hishammuddin and the Police oppressive actions that borders on madness have left a bitter taste in the mouths of all Malaysians. Peaceful gatherings, wearing yellow and walking in peace have met with violent beatings, illogical arrests, tear gas shootings and water canons laced with chemicals. The People will remember that they now have a power weapon to fight back. Their bold people power stand with their VOTES in the next General Election. 4. Technology like sms, the internet news, blogs and twitter have brought significant information that the people will believe to be true over the Government controlled media. Twitter was used widely in the Arab Spring upheaval. Twitter was used extensively today to track what was happening, where to move, who got arrested as well as pictures of the moment. Malaysians are all tech savvy and the use of such technology allowed such massive coordination of 100,000 crowd all over KL to march towards Merdeka Stadium. Check out #bersihstories to read how Malaysians supported each other regardless of ethic groups. Truly 1Malaysia! 5. Peaceful rally is what Bersih 2.0 was all about to highlight 8 points for an Electoral Reform. Instead of taking the claims head on, the Government decided to demonize Bersih, declared illegal including the collor yellow, made numerous arrests with the city locked down together with FRU actions, attempting to use a wild reasoning as if KL was going to be under attack of a foreign force. Bersih 2.0 remained peaceful. Only the Police and FRU were the aggressors. 6. The King demonstrated that he is above politics much to the dismay of Umno. He gave a rare instruction apparently approved by the PM which somehow showed his Kingship caring for the People and truly independent. Najib eventually ignored the King’s advice to work things out with Bersih when he realized that the King met with Bersih thus giving them credibility. Daulat Tuanku! Najib ignores the King’s advice, Ibrahim Ali criticize the King for meeting Bersih. Eventually, the King ignored him and not grant him an audience. The message is clear! 7. Perkasa is a washout. After criticizing the King and received no repercussions, Ibrahim Ali ordered his group to gather at Titiwangsa today at 12pm while he stays home. There were no members from Perkasa even at 2pm. Big mouth Ali has no followers. Bersih had 100,000 Malaysians walking for the future of the country. 8. Umno Youth ‘Patriot’ group led by Khairy gathered at Bukit Bintang. It too fizzled out after the 500 clashed with the FRU and KJ was arrested. At least he had courage but for the wrong thing. 9. Bersih 2.0 committee led by Ambiga stood out as heros for they had nothing to gain but stood up with brave Malaysians for justice in the face of ugly threats and oppressions. These are exemplary Malaysians. Malaysians salute you. BN condems you. 10. Pakatan Rakyat leaders like Anwar, Hadi Awang, Mat Sabu, Lim Kit Siang, Nurul Izzah, Tian Chua, and many more stood up to face possible arrests for walking with Malaysians. Even with the court injunction which is so bizzare, they stood with equal boldness with the rest of Malaysians unlike Ibrahim Ali who is only all mouth. Even KJ had the courage. This will give them full identity with the people whio wants justice and a clean and fair election. PR believes they can now win the next election, thanks to how 9 July has panned out. 11. BN will suffer severe backlash in the next election for sure. The way Umno influenced the maddening reaction to Bersih 2.0 also allowed Umno internal dissent to hit out at Najib. Notice how quiet the other component parties were. They dare not oppose Umno or say anything that might jeopardize BN giving a wrong impression. 12. The writing is on the wall. The people wins. The BN Government loses. The actual effects can only be seen at GE13. The sledgehammer approach to Bersih 2.0 which was declared peaceful did not find acceptance with Malaysians. Instead nobody can believe the madness that the Government conducted themselves as if there was going to be an overthowing of Government today. There is only one redemption for Najib and BN. Listen to the People. Serve them clean and fair. Malaysia wants a government of the people, by the people and for the people. Mr Prime Minister, can you do that? The crowd dispersed and some seen shaking hands with the police. Malaysians are truly mature and the peaceful rally was truly peaceful and the police and FRU were the ones oppressive with shooting tear gas directly at the public, including man handling both man and woman they harassed and arrested. The police action arrested a reportedly over 1,000 people including MPs. As predicted, Ambiga was arrested with some other Bersih committee members. Khalid Samad was injured by a tear gas shot directly at him. Updated 7pm: Ambiga was released. Reports and pictures of Anwar hurt and in the hospital would have given him tremendous boost in his image. His younger daughter was arrested. Hadi Awang and Mat Sabu along with Maria Chin Abdullah and Tian Chua amongst others were arrested. Apparently, Mat Sabu was riding pillion and was allegedly knocked down by a police car and hurt his knee badly. Regardless of a “headless” rally that built up with tens of thousands from various locations in the city, they managed to march up to the Merdeka Stadium and at 4pm the crowd dispersed peacefully. A. Samad Said, 76 year old national laurate, finished with the gallant but mature crowd and commented “I’ve never seen all races in Malaysia so united for one cause before.” And this cause is apolitical. The people has been tolerating a high handed and oppressive pre-emptive actions bordering on madness and ridiculous and braved all the government deterents to gather even such large numbers. One report has put it at 100,000 in various parts of KL. Najib called the crowd a small number of people whilst the IGP claims he counted 6,000. It is now generally agreed by observers including some Umno leaders that the brazzen mishandling of the Bersih 2.0 rally will see serious repercussions at the next General Election for sure. Some even believe that BN who lost the plot today will lose the GE13. A number of international locations including Melbourne, Sydney, London, HK, Taipei, Osaka and Singapore held peaceful demonstrations in support of Bersih 2.0. We are witnessing a new dawn of people power and a maturity that the BN Government had so poorly underestimated. 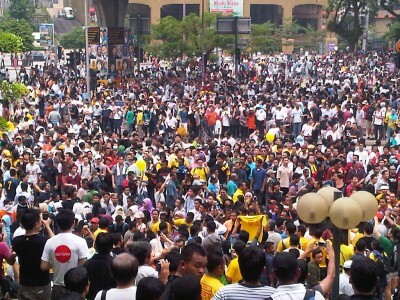 See the pictures of the Global Bersih rallies here. The world can now see how the Malaysian Government has embarassed the country in the oppressive manhandling of Bersih 2.0 acting with madness and making up fantastic excuses to justify their actions. Najib now has his work cut up, and maybe cut off soon enough as he struggles to do the impossible to redeem himself and keep other internal oppressors off his back. Bravo! Malaysians have and will continue to bravely stand up for injustice and a clean and fair election! The Police madness that has put the entire Klang Valley under siege has tipped the anger of all Malaysians. Whatever their reasons, only they can see the logic in their otherwise warpped mind. and you can figure out the next dozen or so repercussions. At this stage, any number of people walking to the Merdeka Stadium will have proven an additional point – the people’s peaceful resolve cannot be stopped even in the face of Police and Government insincerity, double talk and warpped logic. In trying to stop what they call an illegal rally, they have started numerous illegal rallies on the road. And if they think these motorists are going to be so happy with the Police and the BN Government for doing this, they are so wrong. By locking down KL, the Police has caused massive hardship to KL business for the past few days. 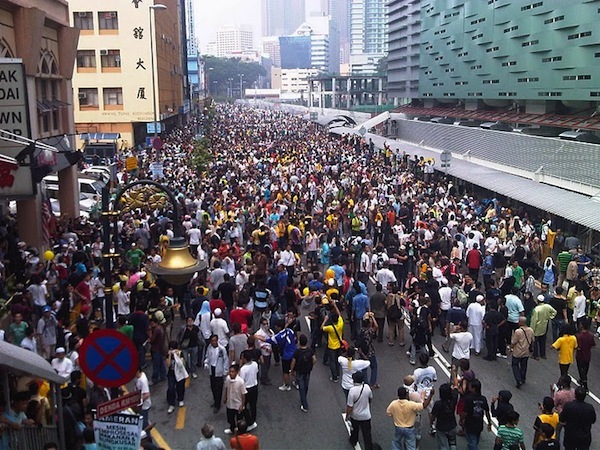 Where are those who claimed that Bersih 2.0 Walk for Democracy is bad for business? Long before the walk, the Government and the Police are killing the KL business and it will go into the hundreds of million if not billion Ringgit loss! Thanks to a pro-stop business police and government who have gone mad over a yet to happen peaceful event. At this stage, Bersih 2.0 is absolutely peaceful – it has not even happened yet but the government and police reaction is like there are terrorists about to take over the city! Who is Disloyal to King and Country? The peaceful Malaysians have been pushed beyond tipping point and have now clearly seen the political selfishness even to ignore and go against the King’s advice. So who is disloyal to King and Country? You have the answer. Bersih 2.0 has been given a new determination now that the PM is insincere, Home Minister is mad and illogical, DPM who is blind to fairness and the IGP who is too eager to serve his political master rather than the master of the country – we Malaysians! No matter how it turns out today, almost all observers believe that the undecided voters, young voters, slow to action voters, BN voters who are doubting the coalition, are all going to vote the opposition to vent their anger and give the Opposition a chance to turn the country aroundand make it better. I wrote a posting entitled Bersih 2.0: Keep it in the Stadium? You must be Joking where I rejected the idea. However, now that the dust has settled after Ambiga met with the King, Bersih 2.0 has agreed to hold the rally in the Stadium. Najib has to sort this out now and Khalid has offered Shah Alam Stadium for the rally. I stand by what I wrote but the twist to this stadium situation is that though technically speaking it is not a street rally but in a practical way, the hundreds of thousand of people going and leaving the stadium works out like a street rally. And in a legal way too. The police fear should subside although the Home Minister is now in a bind after declaring Bersih as “illegal” but the King and Najib have come to terms with Bersih to hold it in a stadium. All the mad arrests no longer have any basis, eventhough there wasn’t any in the first place. Najib doesn’t want to tell Hishammuddin what to do. Hishammuddin and the police keeps doing it. What in the world is going on with the BN Government? They have gone mad? All the drummed up so called Communist charges on the 6 PSM must be dropped and they must be released. The rest of them arrested for wearing yellow and promoting Bersih must be freed immediately as the basis is negated by Najib and the King. Everyone can join the rally on 9 July with no fear and should enjoy Police protection. In fact, Umno Youth will be there in support as Khairi has said he will support if Bersih is held in a stadium. And if Perkasa and Umno Youth so protest again, they should be made illegal and all arrested to be consistent. So this twist is a very interesting one and all to gain for the Rakyat and all to lose for Najib, Hishammuddin and the Police. They have been totally embarassed, called mad and oppressive and lost the Rakyat’s little trust totally. And this can be translated at GE13. 9 July is not here yet and what we say now may not happen the way we see it. Truly, Malaysians are living in interesting times.